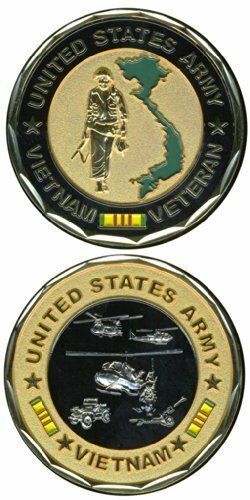 This Army Vietnam Veteran Challenge Coin polished bronze with a diamond wave cut edge. Measuring 1 5/8" diameter each challenge coin has the look and feel of quality. Our Challenge Coins are proudly produced, under strict standards, by the nation's leading manufacturer of military products. Each challenge coin would make a great addition to your collection or a wonderful gift. This Armed Forces Vietnam Veteran 1959 - 1975 Challenge Coin polished bronze with a diamond wave cut edge. Measuring 1 5/8" diameter each challenge coin has the look and feel of quality. Our Challenge Coins are proudly produced, under strict standards, by the nation's leading manufacturer of military products. Each challenge coin would make a great addition to your collection or a wonderful gift. 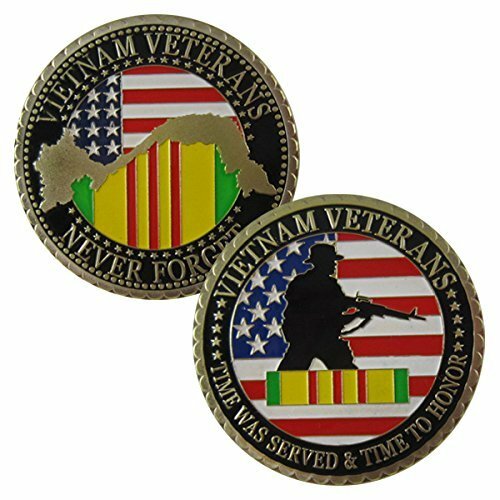 Beautiful Vietnam Veterans - Never Forget colorized gold plated challenge art coin. This item makes a great collectible or gift. Each piece is enclosed in acrylic protective case. Approximately 1 ounce, 1.6" diameter. Coins are printed or painted, not stickers. Not solid gold, nor mint issued. A challenge coin is a small coin or medallion, bearing an organization's insignia or emblem. Traditionally, they are given to enhance morale, in recognition of accomplishments, or when being challenged to achieve a certain goal. Coins given as awards for accomplishments are normally given to the recipient during a handshake, passing from the right hand of the giver to the right hand of the awardee. It is also normal for the giver to offer a brief explanation of the reason for awarding the coin. 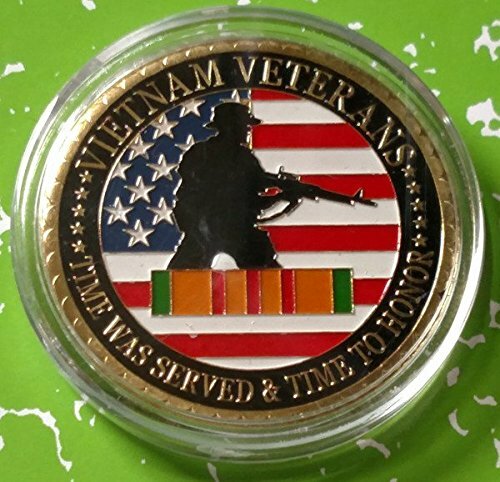 Vietnam Veteran - Harley Engravable Bronze Antique This Harley-Davidson challenge coin is fashioned with the same expert design and quality craftsmanship as your motorcycle. Keep one in your pocket on every ride and show it with pride everywhere bikers gather. 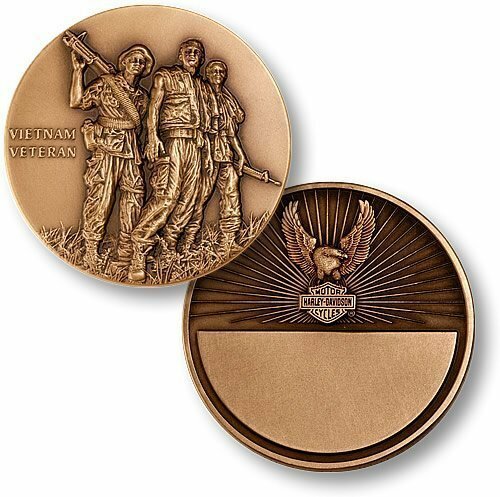 Minted in the U.S.A. from solid brass, this coin honors the unforgettable service and ultimate sacrifice of American lives during the Vietnam War. The classic "Harley" logo design on the back is matched with an engravable space where you can commemorate a special event, that memorable ride, or for a dedication to a friend. 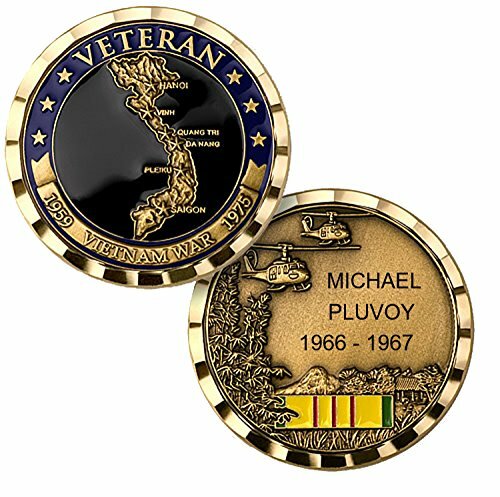 Vietnam Veteran Coin from Vision-Strike-Coins.com! 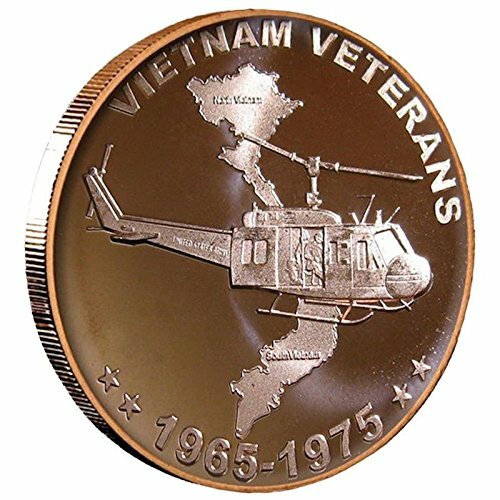 Compare prices on Vietnam Veteran Challenge Coin at Shopsimal.com – use promo codes and coupons for best offers and deals. We work hard to get you amazing deals and collect all avail hot offers online and represent it in one place for the customers. Now our visitors can leverage benefits of big brands and heavy discounts available for that day and for famous brands.